And so our favourite day of the week comes around again. What have you planned for the weekend? I’m feeling a tad bereft because there’s no more footy. Fortunately, I have boxed sets of my beloved Sydney Swans Premiership seasons to see me through the dark times. And lots of books. Lots and lots of books, including the debut release of this week’s Friday Feast guest, Victoria Purman. And I tell you, if there was ever a story to put you in the mood for a long Aussie summer it’ll be Nobody But Him. I met Victoria recently at the Romance Writers of Australia conference in Fremantle and was immediately struck by her professionalism and easy going nature. Then again, she does hail from South Australia, my home state, so these things are to be expected. Nobody But Him is the first in Victoria’s Boys of Summer trilogy (earworm anyone? Since I typed that all I can hear is Don Henley) and has just hit the shelves. Take a gander at this bronzed Aussie! She didn’t expect to run into her first love… or to fall back in love with him! At eighteen, Julia Jones left for the city with a head full of grand plans for an exciting life that certainly didn’t include her hometown of Middle Point – a main street with a pub – or Ryan Blackburn. But fifteen years – and a lifetime later – she’s forced to put her big city life on hold when she heads home to finalise her mother’s estate. Which is where she runs smack bang into the town’s new champion… the same Ryan Blackburn. The sensible thing to do? Stay the hell away from him and head back to Melbourne as fast as her stilettos can carry her. But Julia finds his offer of a helping hand and a hot body too delicious to refuse and dives into a reckless, one-time fling. What she doesn’t realise is that tomorrow has a way of sneaking up, and that saying goodbye to her home town – and to Ryan – is much harder the second time around. You can own your own copy of Nobody But Him with just a couple of clickety-clicks. Buy direct from the publisher Harlequin or try most excellent Australian bookseller and ARRC sponsor Booktopia. There’s also Bookworld, QBD The Bookshop, Boomerang Books, or your local independent or chain store. For the ebook, try Kobo, JB Hi-Fi, Google Play, Amazon (for Kindle), iTunes and the new BigW ebook store. Seriously, it makes me proud to see so all the Australian stories dominating our bricks and mortar stores and virtual shelves at the moment. Anyway, enough of me, here’s Victoria! Has anyone else ever wandered the supermarket aisles and become increasingly concerned about the growing profusion of packet mixes and insta-meals? I get the heebie-jeebies every time I read the back of the label and barely recognize anything that seems like real food. Don’t get me wrong. I’m a working mother of three teenagers and I’m certainly not averse to doing whatever it takes to feed the Hungry Horde. But I don’t want my kids to be loaded down with salt and preservatives and chemicals when I can make the real thing at home – salt and preservative free – for much less. Hence my recipe for my weekly, reliable standby: Chicken Stock. I approach cooking as I do writing a book. On the surface, it’s all exciting – doing the shopping, looking at the labels and the recipe books, making everything look beautifully plated up and Master Chef-y. The writing equivalent is spending lots of time online with search engine terms that include “shirtless” and “man”; thinking about your cover; and how famous you’re going to be when it sells squillions. But when you get down to it, there are some basic you shouldn’t ignore. No matter what genre you write in, every book needs a solid story at its heart. 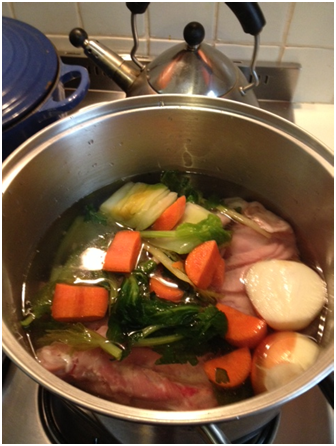 I think of my Chicken Stock that way – a solid base of flavour for a zillion meals. I’m not kidding when I say Chicken Stock is easy. The Hungry Horde doesn’t have time for complicated. I cook up a batch on the weekend and have it sitting in the fridge so I can scoop out what I need during the week for meals in the slow cooker, casserole dishes, stir-fries or soups. It’s especially handy for those dreaded days when all you have left in the fridge is a couple of near-dead zucchinis, a floret or two of broccoli and a cauliflower (you know, the one you bought in the vain hope that your kids would actually eat it). Gather the veggies, chop finely, cook them all up in the stock until tender, give it a whizz and voila – vegetable soup. My kids love it. Even when I tell Boy13 there’s zucchini in it. Chicken carcasses (I use two because they come that way in the supermarket). Don’t worry about trimming off the fat – while important, that comes later. 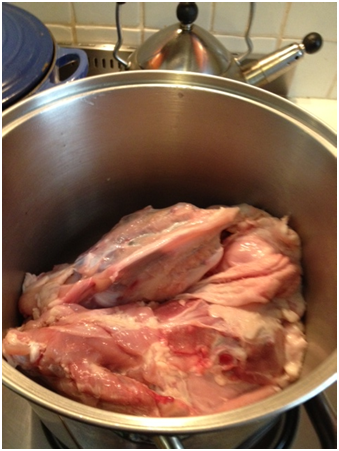 Use a big stock saucepan and place the chicken bones in it. Raid the fridge for whatever veggies you have. I always keep a few celery leaves and stalks in the freezer (did I mention I hate wasting food?) and pop them in to the saucepan with an onion chopped in half (you don’t even need to peel it), and a roughly chopped carrot. Add some minced garlic (from the jar I have in the fridge), a little pepper, and add water until the chicken bones are covered. When it’s boiling, turn down to simmer and let the magnificent aromas fill the house. I usually leave it for about an hour, so the flavours really intensify. Let the stock cool, and then strain out all the chicken and the veggies. Pour into a container and chill overnight. This step is really important, as the fat congeals at the top and can be easily scooped off the next day. Your stock is ready, totally delicious and made from real food. Make soup! Add to day-old rice in a wok and it will taste delicious! Use a cupful any time a recipe calls for stock cubes or stock powder! 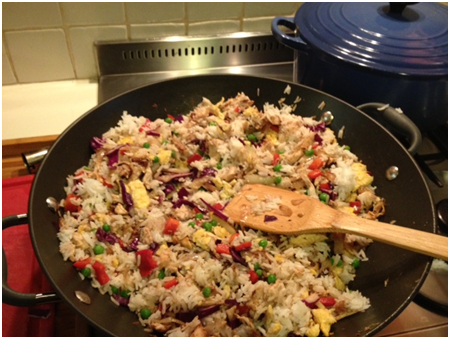 Here’s stir-fry rice I made with the stock. The Hungry Horde loved it. Ahh, Victoria, you’re a woman after my own heart. Actually, can a girl say that or is that a man to woman thing? Hmm. Dunno, but you’re definitely a kindred spirit with all that wine, chocolate and home-made stock. Must be our South Australian genes! Now, my darling Feasters, don those bikinis and budgie smugglers and channel your favourite summer past-time because Victoria has generously offered a most fabulous giveaway. Reveal what you like to get up to over summer and you could win yourself a copy of Nobody But Him. Perfect relaxation material. What do you get up to for summer fun? Share and you could win! Giveaway closes midnight AEST, Tuesday 8th October 2013. Australian postal addresses only. If you’d like to learn more about Victoria and her books please visit her website. You can also connect via Facebook and Twitter. This giveaway has now closed. Congratulations to Kerrie who is in for a whole lot of reading fun with Nobody But Him. Thanks to everyone who joined in. This entry was posted in Friday Feast and tagged Amazon, Australian romance authors, Australian Romance Readers Convention, Australian Writers, BigW, BigW ebooks, book giveaway, Booktopia, Bookworld, Boomerang Books, Boys of Summer, Cathryn Hein, Chicken recipes, Chicken Stock, Chicken stock recipe, Cooking, Food, Friday Feast, giveaways, Google Play, Harlequin, iTunes, JB Hi-Fi, Kindle, Kobo, Nobody But Him, Nobody But Him by Victoria Purman, promo, QBD The Bookshop, Recipes, Romance Writers of Australia, Romance Writers of Australia Conference, South Australia, Sydney Swans, Victoria Purman on October 4, 2013 by cathrynhein. It’s here! And I came very, very close to popping the champagne before 8am this morning. Why? Because Heartland received the most gobsmacking review from Bree, at 1 Girl, 2 Many Books. Isn’t that the loveliest thing? Read Bree’s full review of Heartland here. But wait, there’s more! Bree also has an in-depth Q&A with me, covering everything from how I choose my settings, to my love for the Sydney Swans, to what was the most difficult part of Heartland to write. Plus a teensy bit about my next book. Check it out! 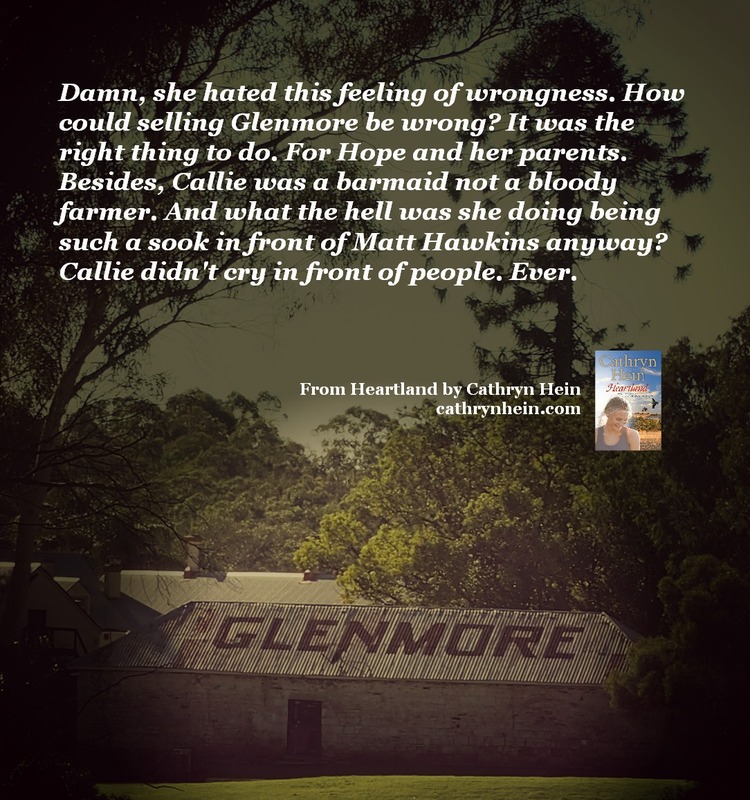 Also around the net, I’m on the Australian Romance Readers Association’s blog, talking about what made Heartland special to write. All ARRA members who comment will go into the draw to win a copy. Tomorrow, ANZAC Day, I’m at Book Muster Down Under with an author Q&A (including some seriously tricky questions) and with THREE copies of Heartland up for grabs courtesy of my publisher, Penguin Australia. Friday will see me flopping about with exhaustion… or perhaps not. No rest for the bookish! I’m hosting myself here on Friday Feast and revealing some of the onerous research I had to undertake for Heartland. I’m talking winery visiting onerous. Terrible, but we authors are selfless creatures and don’t mind suffering for our craft. Oh, and there’ll be a Heartland giveaway too. But you’ll have to work for it with a wine-y story! Also on Friday, I’ll be at Jenn J McLeod’s Author Harvest, discussing garden gnomes, what my protagonists think about me, and the current lust of my life, Inspector Davide Rivera from Rex in Rome…among other equally serious and important things! Then on Sunday, 28th April, it’s back to ARRA for a guest post titled The Heart of Rural Romance. Find out what makes this genre so great. Oh, and before I go, three things. 1/. Heartland is in this week’s BigW catalogue. Wheeeeee! 2/. The ebook price promo will run out soon. Get in quick if you want to score Heartland at a discount. Try Amazon (Kindle), Kobo, Google Play or iTunes. There’s also special pricing for Heart of the Valley and Promises. 3/. My Goodreads giveaway closes May 1st. Simply visit Heartland’s page and clickety-click the Enter to Win button. To finish off , thank you to everyone for your amazing support. I’ve been overwhelmed with congratulations this morning and made to feel really special. I can’t express how much that means to me. Nearly forgot! I have another Heartland quote for you. Mustn’t let all my photo fiddling go to waste! This entry was posted in Heartland, News and tagged 1 Girl 2 Many Books, Australian romance authors, Australian Romance Readers Association, Australian Writers, Author Harvest, BigW, book giveaway, Book Muster Down Under, Cathryn Hein, Davide Rivera, ebooks, Friday Feast, giveaways, Goodreads, Google Play, Heart of the Valley, Heartland, Interviews, iTunes, Jenn J McLeod, Kindle, Kobo, Penguin Australia, Promises, promo, Research, Rex in Rome, rural romance, Sydney Swans on April 24, 2013 by cathrynhein.